Spring blooming bulbs are usually planted in the fall and left to fend for themselves throughout the winter. 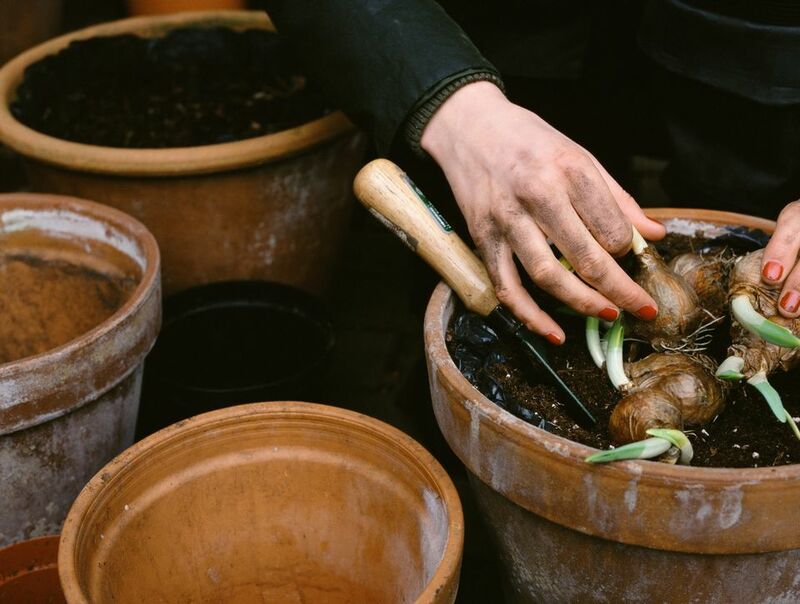 The bulbs generally come with planting instructions for how deep to bury them and how much sun exposure they will need, but whether to feed the bulbs is not often mentioned. Those big fat bulbs represent all the energy and food the plants have stored up for next season’s bloom. When you first plant spring-blooming bulbs, the only thing they need to do that winter is send down some new roots. To help the bulbs do this, we feed newly planted bulbs with a balanced fertilizer that has a good dose of phosphorous in it. That’s what "Bulb Food" is and why bone meal is often recommended. Bone meal used to be the recommended way to feed flowering bulbs, but current meat processing procedures have a tendency to reduce the amount of phosphorus remaining in the bones, so a bulb food is not preferred. As the bulbs grow in the spring, this storehouse of food and energy is all expended and the bulbs need to produce and store more. The most important thing you can do for your bulbs in the spring is to let the foliage grow as long as it can. Do not prune, cover, or braid the leaves. This is how the bulbs feed themselves. You can cut off the flower stalks if you like. If you planted bulbs that naturalize, it’s best to leave them on and let them set seed. After that, the experts tend to disagree. Some favor top dressing with fertilizer each fall. Others recommend an early spring feeding and still others say not to do anything until the flowers have faded. Some supplemental spring feeding makes sense for flowering bulbs, especially if you use a slow release fertilizer. Although the bulbs are using their own reserves for food, they are expending a lot of energy and will be pulling nutrients from the soil. It is recommended you fertilizer early rather than waiting until after the blooms have faded because spring flowering bulbs have such a short growing season and you will want to make sure the fertilizer is accessible in time and that the plant has the opportunity to grow and store energy for as long as it can.